This is the same as the original units except the electronics are new LED panels. This Cabinet is made with solid walnut wood and is an exact replica to the original Electro mechanical score unit cabinets. 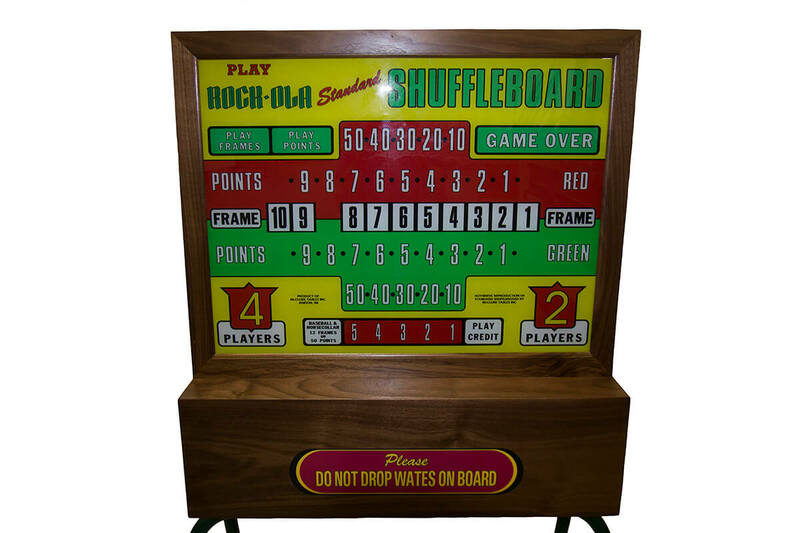 Features remote control Boxes to score from both ends of the shuffleboard. Features real glass panels not plexiglass. Note: You may have to drill or adapt the pole mount kit to fit your table if installing on an Antique Rock Ola. The score unit Pole mounts to the deck. All hardware, wire harness and wood control boxes included. Unit is crated and includes shipping. This is for a Walnut cabinet but also available in optional hard maple wood.